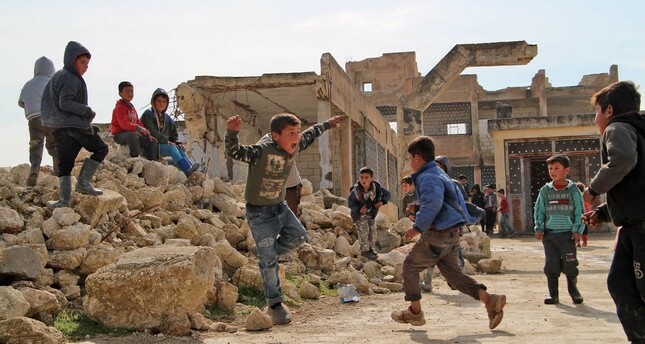 Children play in the yard of a school that was partially destroyed during battles in the village of Kufayr, in Syria’s Idlib Governorate, Feb. 4, 2019. In a bid to solve the complex issues in Syria, particularly the tensions in the northwestern province of Idlib, officials from Turkey and Russia held diplomatic talks. Russia's Defense Minister Sergei Shoigu paid a visit to Ankara Monday upon the invitation of his Turkish counterpart Gen. Hulusi Akar to discuss the latest developments in Syria. The visit came prior to the trilateral leader's summit between Turkey, Russia and Iran that will be held in the Russian resort city of Sochi on Feb. 14 with the presidents of the three countries. According to the Turkish Defense Ministry's statement that was released after the meeting, the ministers discussed the latest situation in Syria and exchanged views on the measures that could be taken to ensure security in the demilitarized zone in Idlib. They affirmed their commitment to the Astana agreement, the statement added. The two countries also agreed on intelligence and military cooperation in Idlib to ensure peace and security in the region. Speaking after the meeting, Akar said that efforts to boost bilateral relations are "valuable" and will contribute to peace and regional stability. Shoigu thanked Akar for the warm reception and recalled that military experts from both sides met in Moscow earlier this month to talk about "the most important issues for the Syrian settlement regarding further stabilization in the Idlib zone and everything that concerns the eastern bank of the Euphrates." The enhanced visits as well as strong personal diplomacy between President Recep Tayyip Erdoğan and his Russian counterpart Vladimir Putin have indicated that they will continue to work together to find a solution to the Syrian crisis. The two countries, which were once foes, suffered from corrosive conflicts throughout history that were triggered by historical grievances, now have solid diplomatic cooperation. This has paved a way to stop the bloodshed to a certain extent and maintain stability in the war-torn country. Yet, the existence of the formerly al-Qaida affiliated terrorist group – the Hayat Tahrir al-Sham (HTS) in Idlib – currently remains a vexing problem. The Moscow-based Eurasia analyst and journalist Eşref Yalınkılıçlı told Daily Sabah that both parties have been doing their best to maintain the cease-fire in Idlib, however, he added, that Russia expects Turkey to push its limits more to tackle the HTS issue by military means. "Even though Moscow grumbles via lower-level officials, it does not overtly express disappointment over the Idlib issue yet and it refrains from blaming Ankara," he said. After Monday's meeting between the defense ministers, Akar said that these talks will considerably contribute to the peace and stability of the region. For his part, Shoigu said Russia and Turkey did a significant job in Idlib and the east of the Euphrates River, adding that he expects further coordination on key issues. Three possible scenarios lie on the table to eliminate the HTS in the province, recent reports suggest. First, is forcing the militants to leave, possibly by applying coercive measures including a military offensive, a solution favored by the Bashar Assad regime and its allies, Russia and Iran. However, this "solution" makes Ankara's blood run cold due to concerns of triggering a new migrant wave bound toward Turkey's borders. Ankara previously fended off such a hazardous scenario for itself with the Sochi agreement that was reached between Turkey and Russia in September 2018 to decrease tensions and avoid new conflicts in Idlib. Prior to the Sochi agreement, Syria's Bashar Assad regime was preparing for a full-scale attack on Idlib, the last opposition stronghold. It was feared that it would cause a humanitarian catastrophe in Idlb, which is home to about 3.5 million – many internally displaced – Syrians. Hosting nearly 4 million Syrians that fled from the civil war, many Turkish citizens think that Ankara has already gone far beyond its capacity. Turkey would prefer to launch a limited operation to break the resistance of the HTS or continue negotiations to persuade militants to dissolve the organization. The two countries are on the same page on supporting the U.S. withdrawal from Syria, another vital issue regarding the Syrian peace process. Russian Deputy Foreign Minister Sergei Ryabkov told reporters Monday that Moscow insists that the U.S. should fulfill its pledge to fully withdraw from Syria. "We insist that the United States fulfill its pledge and fully withdraw from Syria," he said. On Dec. 19, 2018, U.S. President Donald Trump ordered a full withdrawal of U.S. troops from Syria, claiming that Daesh terrorist organization had been defeated. Enes Yalman, the director of the International Office of Ibn Haldun University, said that the developments in Idlib and Manbij are closely related with U.S. withdrawal process. "The main agenda of Turkish-Russian talks is to determine a road-map for the post-U.S. era. Russia also tries to form a direct contact between Bashar Assad regime and Turkey, which, Ankara has so far strongly rejected," he said. Along with ongoing talks on Idlib, Turkish and Russian officials are scrambling to form a constitutional committee, a key process for a political solution centered on the Astana process, which is sponsored by the two countries and Iran. However, there are also shelved disagreements, including the role of the PKK-affiliated People's Protection Units (YPG) in Syria's future. Yalınkılıçlı said that both Turkey and Russia support the presence of Kurds in the talks for a political solution in Syria, but who they call "Kurds" in this context is drastically different. "Russia is trying to include the YPG on the political table as the representative of the Kurds, which is a red line for the Turkish side," he emphasized. Turkey sees the YPG as Syrian extension of the PKK terrorist organization, which claimed the lives of over 40,000 people during its 30-year terror campaign against the Turkish state.